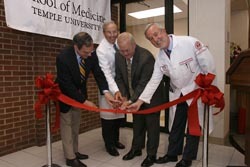 Temple University Physicians has opened a newly remodeled Medical Office Building that will house the clinical practices and academic offices for the Department of Medicine’s sections of endocrinology, nephrology and rheumatology, as well as the Department of Family and Community Medicine and the Kidney Transplant Program. The building, located at 3300 N. Broad St., in the former Skin and Cancer Center, will enable physicians and staff to provide comprehensive and integrated medical care services in a modern, patient-focused environment, according to Edward Kushmerek, chief executive officer of TUP. There’s also new laboratory and research space, as well as conference and meeting areas. The new facility is part of TUP’s overall expansion strategy, which includes plans for new sites in Center City, Northeast Philadelphia and other areas in the region. TUP, the School of Medicine’s physician practice plan, comprises approximately 300 full-time and 900 part-time faculty members who practice in 18 academic departments and include virtually every subspecialty in medicine: www.temple.edu/medicine/departments_centers/clinical_departments/index.htm. Temple employees and dependents wishing to make an appointment with a Temple physician can call Family First at 215-707-5300. The Family First program, designed for the convenience of Temple employees and their dependents, holds special appointment slots, waives all co-payments and offers free parking to those with university parking. All other patients can call 215-707-4600 for an appointment. Patient hours are 8 a.m. to 5 p.m. Parking is available at either the Ontario Street garage or the lot on the south side of the building.